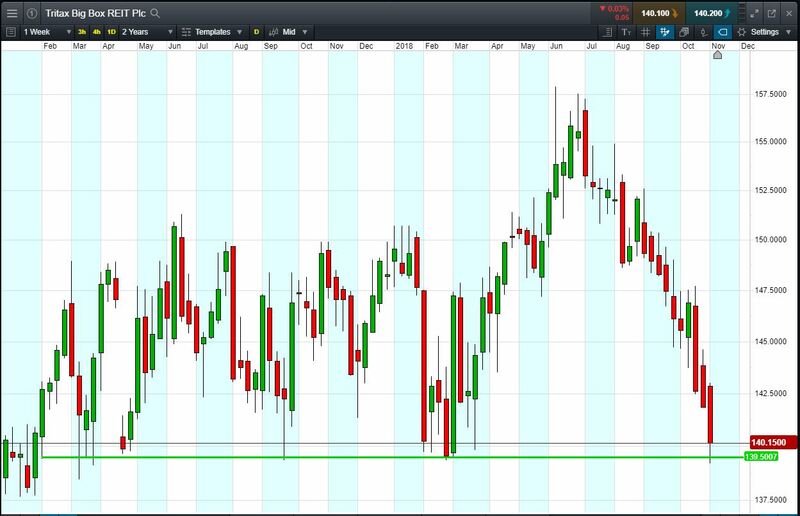 Will Tritax Big Box REIT break support, or will it rise again back to recent 157p highs? Tritax Big Box has a 139p support zone since February 2017, bouncing 7 times, most recently this week. Now trading 140.1p at time of writing). Will the pattern repeat itself, with the shares bouncing off support again? Tritax Big Box invests in large-scale logistics real estate and operates “big box” stores. Let’s say you like the Tritax Big Box chart and you think the price is heading back towards 157p again. You decide to buy exposure to £10,000 worth of Tritax Big Box using a CFD, at the current price of 140.1p. To do this, you need £2,000. Let’s assume Tritax Big Box rises back to 157p (+12%). Your profit would be £1200, from your initial investment of £2,000. Conversely, let’s assume you open the above position, and place a stop-loss at 6% from the current price. Tritax Big Box falls 6% and hits your stop-loss. Your loss would be £600.